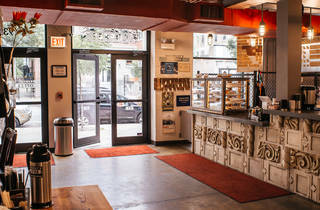 Everybody's Coffee brings fair and direct trade coffee to the Uptown neighborhood. Baked goods are also available that are made in store. This place makes me feel awesome. Yes I'm just getting a cup of coffee and maybe a pastry (both excellent quality, I may add), but to walk in and feel instantly welcomed and friendly is something I love. If I want to try something new they're always ready with a recommendation, and the atmosphere is warm and inviting. I've never felt welcome in hipster coffee shops. I'm always greeted with a smile. The coffee is amazing, no matter if you like dark or lighter roasts. They really cater to everyone without making it look challenging. And the staff is above and beyond nice. To be treated like a person, and not just a consumer. Its pretty fantastic. They don't skimp on customer service, nor the quality of coffee made. I've never met more approachable strangers. They have the most creative coffee menu in the city. Love the menu and the atmosphere. Great drinks, great home made pastries, great art work. The friendliest and helpful staff of any coffeshop. Wonderful teas and coffees. Beautiful space. Great bakery goods. Friendly staff. Very Nice bathrooms. Everything you want in a coffee shop. Also, occasional concerts in late evenings (last hour concert series) local art showings. Free Films shown on weekdays in connecting theater. Not only is the staff incredibly helpful and friendly, but the coffee is superb and the pastries are fantastic. I literally go here every morning and cannot recommend this cafe more enthusiastically. If I could give more than five stars, I would. As someone who averages 4-5 different coffee shops a week, I can honestly say that I've never had such consistently perfect beverages and unfailingly friendly/unpretentious service anywhere else. 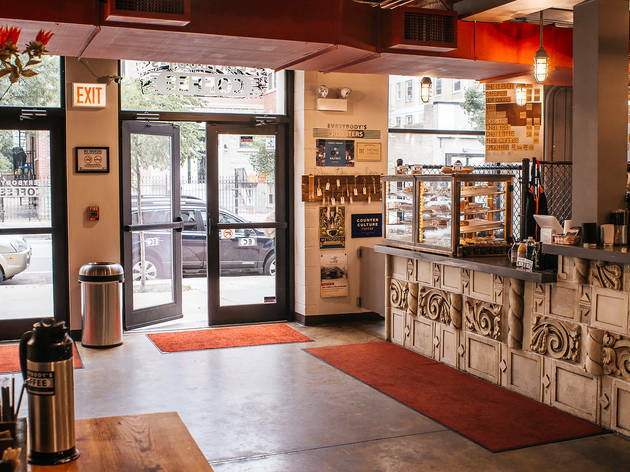 With plenty of seating, natural light, and an exquisite and interesting rotation of art, this is definitely on Chicago's elite coffee destinations. Such phenomenal owners that really know about sharing the business with the community. Plus no matter who you are you'll be greated like a regular and at somepoint share a handshake. Couldn't be more proud to give my vote because they have professional Barista's here that are known personally instead of just getting to know the name of the business. They really take care of their employees and brew one of the best Aeropress cups in town. Did you know their head Barista almost won the Midwest Aeropress championship plus they hosted the event. Major applause! Great coffee choices, teas, pastries. They have wonderful art shows every few weeks and the ambiance is perfect for a Time Out with friends! Open, art - rich environment with wonderful coffee and baked goods, and excellent service. Highly recommended! Beautiful, comfortable place to relax or meet, with delicious baked goods and coffee. What's not to love? The service and atmosphere is great here. The baked goods are to die for, and the revolving art show is always interesting! Wonderfully friendly staff and a great place to be :) Their lemon pound cake is to die for! My favorite coffee shop. Since Intelligentsia has gotten too expensive and highbrow for me, this has truly become a coffee shop for everybody, with sane prices and competent baristas. They have awesome shows and events going on all the time in the same building, making it a great place to go in general. This Wilson Avenue populist spot's clientele is one clue to how eclectic Uptown itself is; the name's a clue. Incredible homemade bakery goods and award-winning baristas make the taste buds happy. Utterly unique. It's all in the name. I always feel at home there and it's not an "IN" crowd. They legitimately welcome people from all walks of life, and everybody gets great coffee. Good vibe. Sweet art all the time. They rock. Best! Great coffee, kind customer service! Great coffee, great atmosphere! ! Amazing coffee, delicious pastries and lunch items and fantastic and friendly staff!!! Best coffee shop in the City! Nice atmosphere, creative design, great drinks, baristas friendly!